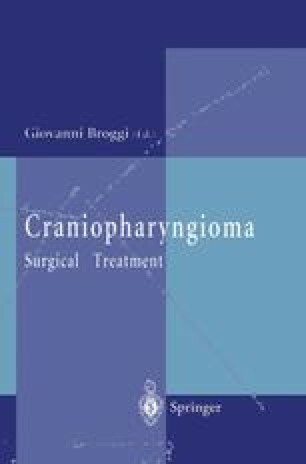 Over the past decades the results of surgical treatment of craniopharyngiomas have substantially improved due to precise diagnosis using computed tomography (CT) and magnetic resonance imaging (MRI), better surgical technique, and more effective postoperative intensive care. Some neurosurgeons have achieved very impressive and promising results (Suzuki et al. 1984; Symon and Sprich 1985; Yasargil et al. 1987; Choux et al.1991). In spite of this, the treatment of craniopharyngiomas as a whole still presents one of the most serious neurosurgical problems.